The tourist orientation system PRAGUE CITY LINE is a novel combination of a standard printed guidebook and direction signs right in the streets of the city which facilitate orientation in a new place. Prague – is one of the most visited cities in Europe – it has got many adjectives: magical, mysterious, romantic, the City of a hundred towers. The charm of Prague and its magic has developed through the uninterrupted one thousand years long development. The streets we walk through often follow the trading routes of the bygone era of the City origins. Prague likes to uncover its secrets to sensitive eyes and hearts and our main wish is that you enjoy every moment, which you will stay in this beautiful City, and that Prague will stay forever recorded in your memories.PRAGUE CITY LINE street signs form a continous route leading visitors to Prague past selected significant Prague historic sights and cultural objects. The actual PRAGUE CITY LINE route is marked with silver metal street ground signs PRAGUE CITY LINE placed mostly at the kerb of pavements. An advantage of such signs is the fact that they form a continuous route and meet the basic request for such information systems, that is, standing at one sign one can see the following one. In the areas where the possibility of finding one_s direction is made more difficult due to various circumstances, the PRAGUE CITY LINE signs are more numerous to ensure that a visitor to Prague using this system should not miss further link-up with the route. The size of the sign is designed to make the sign impossible to overlook and the orientation in the PRAGUE CITY LINE system as clear as possible. PRAGUE CITY LINE tourist guidebook is the other part of the tourist orientation system. 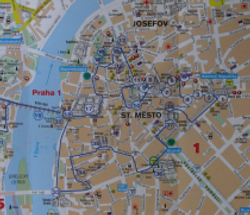 Its basic part is a tourist map of Prague with the plan of actual street route showing numbered stops at the selected sights. More precisely, it is a tourist guidebook describing an actual street route. 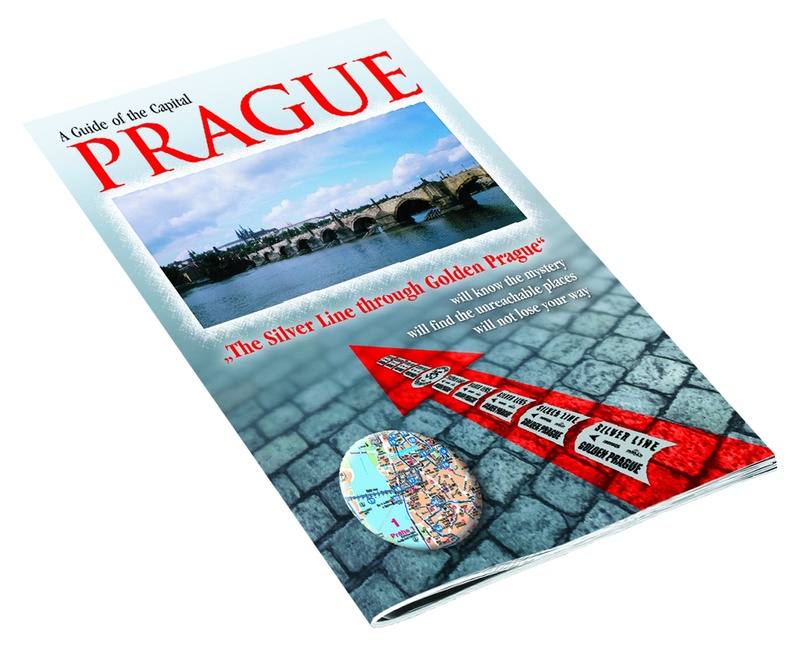 It gives a more detailed outline of historic and cultural objects appearing in the PRAGUE CITY LINE route. It describes the objects from the historic and architectural point of view and brings various interesting facts attached to an object. The tourist guidebook is supplemented with anumber of colour photographs of the presented objects, layout plans of more interesting or larger places (e.g.,Prague Castle), and useful information like addressess of embassies. The map of Inner Prague is also included.